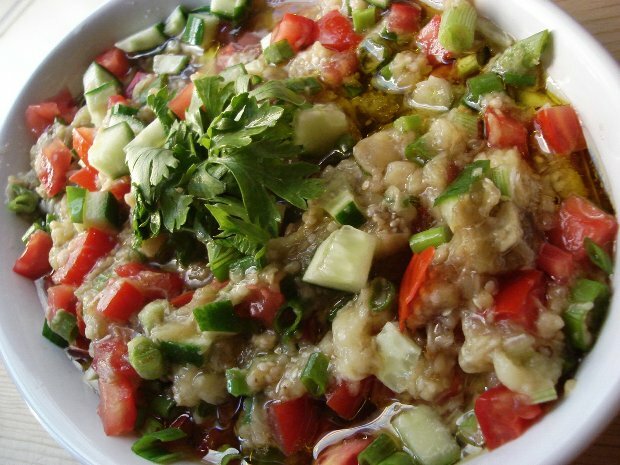 Prepare the dressing by whisking vinegar, lemon juice, olive oil. Then add the salt. Combine all the ingredients in a large salad bowl, mix with the dressing and serve. Soak the beans in cold water for 8 hours or overnight. Add clean water into a pot and cook the beans until softened. Add 1 tsp. salt then boil for another 5 minutes. Strain and set aside. Add the remaining salt to the onions and rub for about 5 minutes, then wash and squeeze out the extra water. Mix the parsley, onions and beans. Whisk the olive oil with vinegar. Add this dressing to the salad and mix. Serve with boiled eggs and black olives on top. Heat the oven to 350F. Stab the eggplants with a small knife in several spots, then place in the oven and bake until softened. Take the eggplants out of the oven and peel the skin and remove the stem. Chop the eggplant into very small pieces with the help of a sharp knife. (You may use a blender to do this, but it is better to keep it a little chunky). To the chopped eggplant add garlic, salt, lemon juice and olive oil and mix well. Serve at room temperature or cold. Not: Alternatively you may choose to roast the eggplants over a charcoal grill for a smoky flavor. Boil the red lentils, together with water until the lentils have softened to a sort of liquid state. To this add the bulgur, mix and cover with a lid for about 10-15 minutes until the bulgur is cooked with the heat of the hot lentils. Meanwhile in a pan, heat the olive oil and sauté the onions until softened. Add the tomato paste and continue sautéing for another 5 minutes. Take the lid off the lentils and add the sautéed onions, scallions, parsley, pomegranate molasses, lemon juice, red pepper flakes, salt and black pepper and mix well, until it sticks together. Take walnut size pieces from this mixture and squeeze in your hand to give a wavy oval shape. Serve with lettuce leaves and lemon wedges. 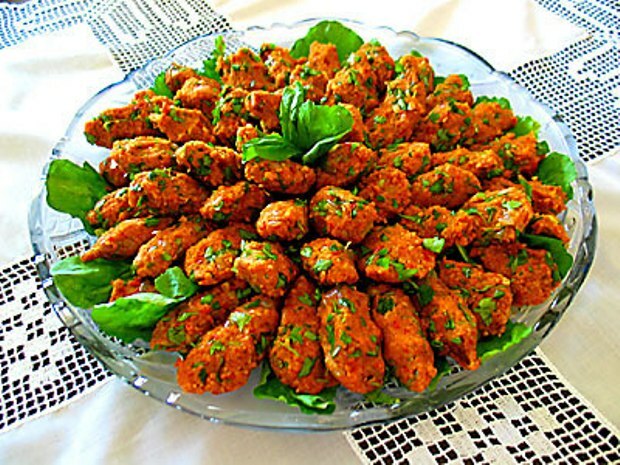 Place in the bulgur in a glass container. Melt the tomato paste in the lukewarm water, then add this to the bulgur, stir once and cover the container with stretch film. Set aside for 15-20 minutes until the bulgur is softened. Then add the rest of the ingredients and mix well. Serve at room temperature in a large bowl or serving platter.